Third-party Twitter app Twitterrific reached version 5.18 on Thursday, bringing several improvements including an additional dark visual theme and tweet poll detection. 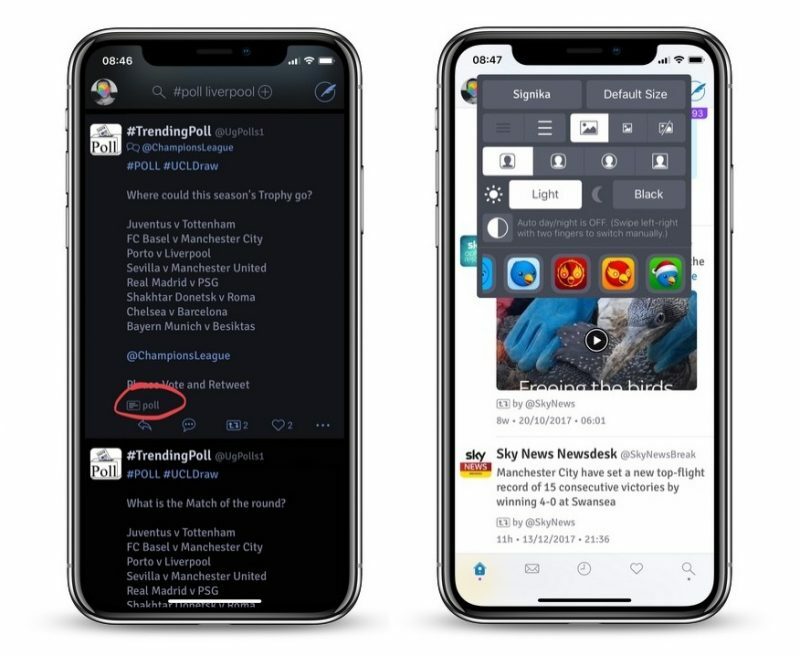 In what should come as good news to heavy users on iPhone X, Twitterrific has added a new energy-saving "true black" theme, which now appears as an option alongside the existing dark theme. The Theme panel has also been expanded in other ways, including support for avatar shapes – rounded rectangle, squircle, circle and square – improved font size selections, and bonus app icons that can be unlocked by using Twitterrific for Mac or the Tip Jar. Building on a recently introduced feature in the latest version of the Mac app, Twitterrific for iOS now recognizes polls in feeds, indicated by a button at the bottom of a tweet. Clicking the button opens the poll in an integrated mini-browser that users can then use to submit their vote. Users can also now tag their own tweets with #poll or use a graph or ballot box Emoji at the beginning or end, and the app will recognize them as such. Elsewhere, a number of improvements to the app have been made across the board. Highlights include: Muffle rules that can now be deactivated without having to delete them, automatically deactivating themselves after 60 days of inactivity; unread tweet indicator dots; support for Dynamic Type; and timestamps for quoted tweets that now also respect the hidden thumbnail mode. Twitterrific for iOS v5.18 is a free download on the App Store for iPhone and iPad. [Direct Link] while Twitterrific 5.2 for Mac is $19.99 on the Mac App Store [Direct Link]. Every app should adopt dark theme without waiting for Apple. And twitter, that weird dark blue colour is not dark theme. Have to imperfect something, isn't it. Great that Twitterrific has poll detection but utterly ridiculous that Twitter doesn’t allow third-party clients native polls.